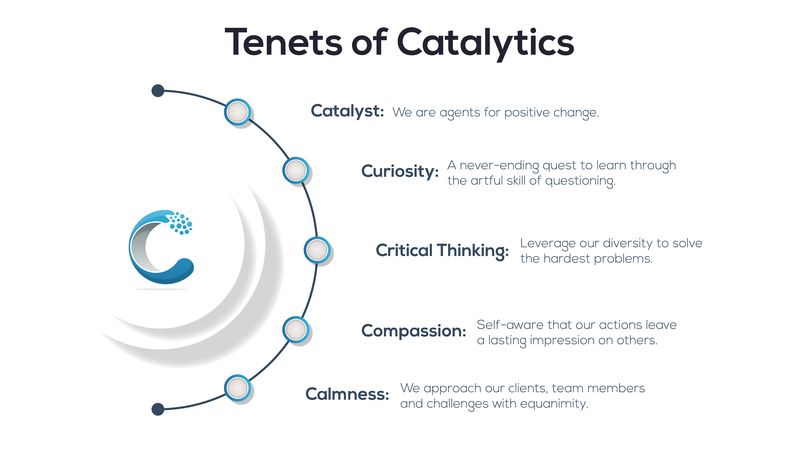 Catalytics offers a wide range of consulting services aimed at helping companies reach their full potential. We have driven result for large multi-national Fortune 500 companies as well as Pre-Series A startups. Our services are tailored to your needs so your “one-of-a-kind” challenge is addressed. Catalysis is the change in speed of a chemical reaction due to the help of a catalyst. Your industry is unique, your culture is unique, your challenge is unique. At Catalytics, we recognize the opportunity for change, identify the best approach and make the change happen. This approach is predicated on injecting qualified, seasoned professionals (called Catalysts) that can introduce entrepreneurial approaches to problem-solving (Lean Startup/Design Thinking) and launch emerging technologies (Artificial Intelligence / Machine Learning). © Copyright - Catalytics Consulting. All Rights Reserved.